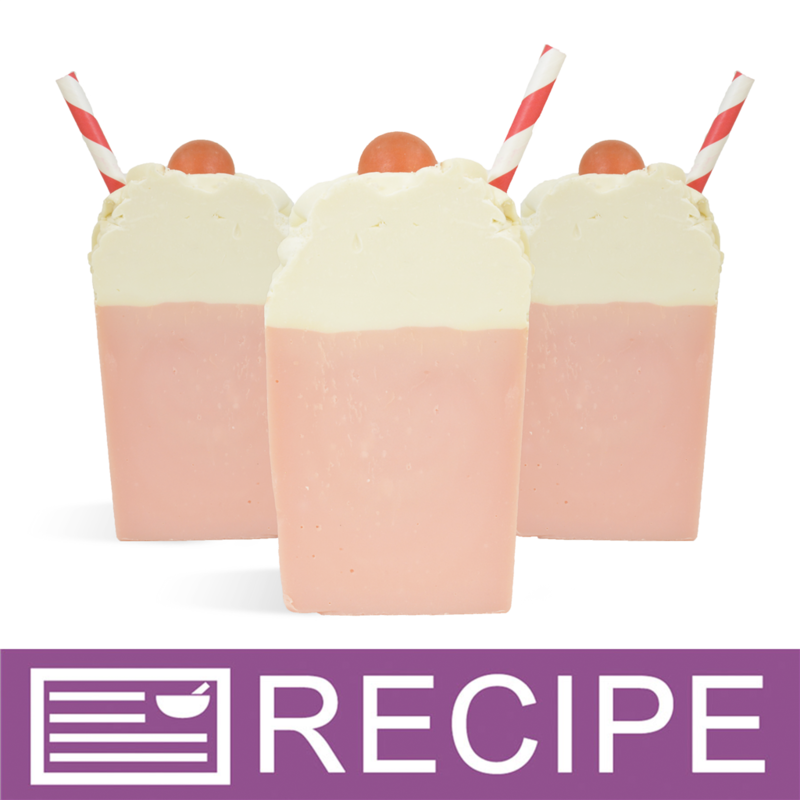 This cold process strawberry milkshake soap can almost pass for the real deal! 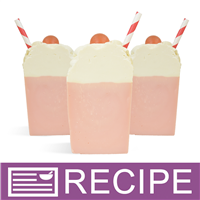 It smells like sweet, ripe strawberries and is complete with a striped straw and a cherry on top! INCI Ingredient Label: Olive Oil, Water, Coconut Oil, Avocado Oil, Sodium Hydroxide, Palm Kernel Oil, Mango Butter, Fragrance, Sodium Lactate, Sorbitol, Propylene Glycol, Sodium Laureth Sulfate, Stearic Acid, Lauric Acid, Sodium Hydroxide, Glycerin, Fluorphlogopite, Iron Oxide, Titanium Dioxide, Mica, Silica. Add all the oils and butters to measuring cup and melt in the microwave or on stove top. Set aside. Melt sparkle red MP and fill eight of the round ball cavities. Allow to harden completely. Cut paper straws in half and set aside for later. You may want to mark the silicone mold to know where you will place the embeds. You can do this by placing a ruler down the length of the mold. From the inside of one end, measure out ½" and make a mark. Then, make a mark every inch after that until you reach the other end of the loaf mold. Using mini mixer, blend matte white with a small amount of melted oils in funnel pitcher. Do the same with the mica powder and a small amount of melted oils in a plastic beaker. Set aside for later. When both the lye mixture and the oils are 120°F or below, add sodium lactate to the lye water. Combine fragrance oil and stabilizer and allow to sit for at least two minutes. Pour the lye mixture into the oils. Stick blend until you reach a thin trace. Pour 18 oz. of batter into the funnel pitcher with white colorant. Add fragrance oil and mica colorant to the remaining batter. Bring the white soap to a thick trace and set aside, this will be used for the whipped topping. Mix the pink soap to a medium trace and then fill the loaf mold. Tap to release any air bubbles. When the white soap is at a very thick trace that is able to hold its shape, fill the pastry bag. Pipe the white soap onto the loaf to look like whipped cream. Place a straw and a cherry at each mark. Allow to set for 24 hours or longer until soap is firm enough to unmold. Unmold and slice. Let soap cure 4-6 weeks. NOTE: The pink mica can turn an orange color, while it should gradually turn back to it’s original pink color.